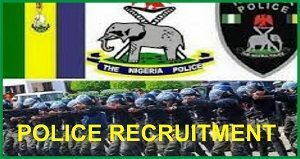 Nigerian Police Force Recruitment 2018-2019 is ongoing, application form is out apply now! This is to inform the general public especially applicant who wish to join the Nigerian Police Force, that the Nigerian Police is recruiting massively in order to align with International standard and best practices and the United Nation Standard of Policing, the Force needs virile and dynamic police officers for better service delivery and mitigating emerging security challenges. Apply here. The Nigerian Police Force Recruitment 2018-2019are invited from qualified Nigerian Citizen into the Nigerian Force. The Nigerian Police Force Recruiting interested applicants into the force as constables before applying for Nigerian Police Force jobs, applicants must know first if they are eligible to apply, see below the eligibility for 2018 edition ofNigerian Police Force Recruitment 2018-2019 as instructed by the Nigerian Police Force Recruitment team. Applicants shall be of Nigerian origin by birth and possess National Identity Number (NIN)Applicants must possess a minimum of 5 credits in not more than 2 sittings in WASSCE/GCE/NECO/NABTEB with credit passess in English and Mathematics. Applicants must be aged between 18-25 years by March 2018Applicants must be medically, physically, and psychologically fit and must not be less than 1.67mtrs tall for male and 1.64mtrs tall for female.